The apartment is a leisurely 10 minute stroll from the village or 2 minutes by car. There are 17 cafes and restaurants in the village, all within walking distance along with a small supermarket, butcher, pharmacy and many more little shops. Quillan is a market village and there are weekly markets on Wednesdays and Saturdays with a variety of stalls. 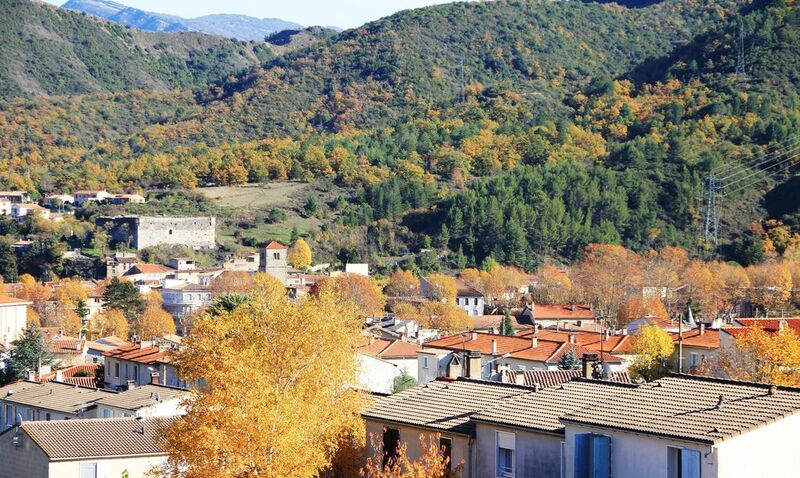 The apartment is located in a quiet street and has views over the village with the foothills of the Pyrenees beyond. There are numerous walks in the surrounding foothills, a swimming lake just 4 minutes drive with loads of amenities and of course the area is well known for its Cathar castles. Not suitable for young children and no pets please. We are both Australian, retired, and have been living in France since 2014. We love the history of France and the French are so polite and very helpful, many speak some English in our village which is good, but doesn't improve our French. This property suited us as it has two apartments, handy when family and friends visit and good holiday rental opportunity at other times. The apartments are basic yet comfortable. The living area has a pull out sofa bed, fully equipped kitchen, private bathroom and private terrace. Both apartments have terrific views, short walk to the village, quiet location. I will allocate which apartment you get when you book, they are both of similar size and fit-out.